A short woman stands facing the wall of her studio. Sunlight beams through the elongated windows and illuminates a canvas that her attention is directed toward. Paintbrush in hand, a determined look is on her face as she fills the text riddling her canvas with white paint. 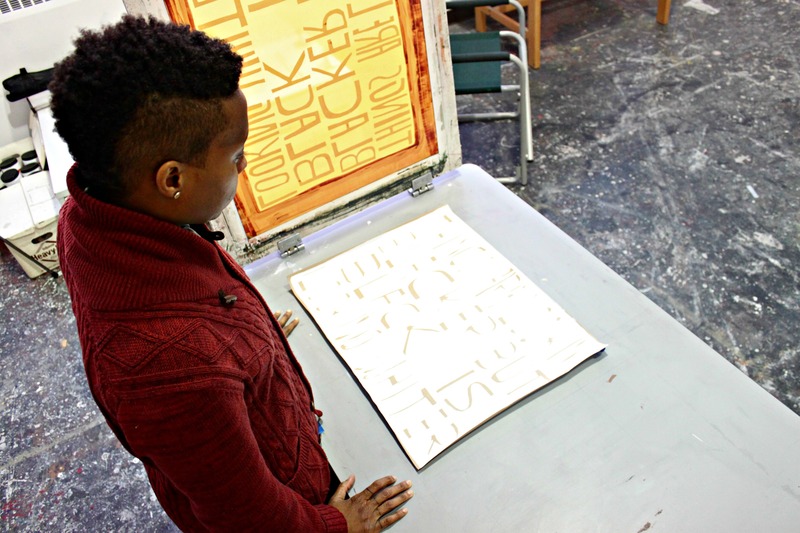 Ayanah Moor is hard at work, producing art for her upcoming three week showcase. Moor is Georgia State’s first resident artist for its Arts and Humanities department, the result of a new program financed by Ernest G. Welch himself. Assistant Professor of Sculpture Ruth Stanford said Moor is perfect for the job. 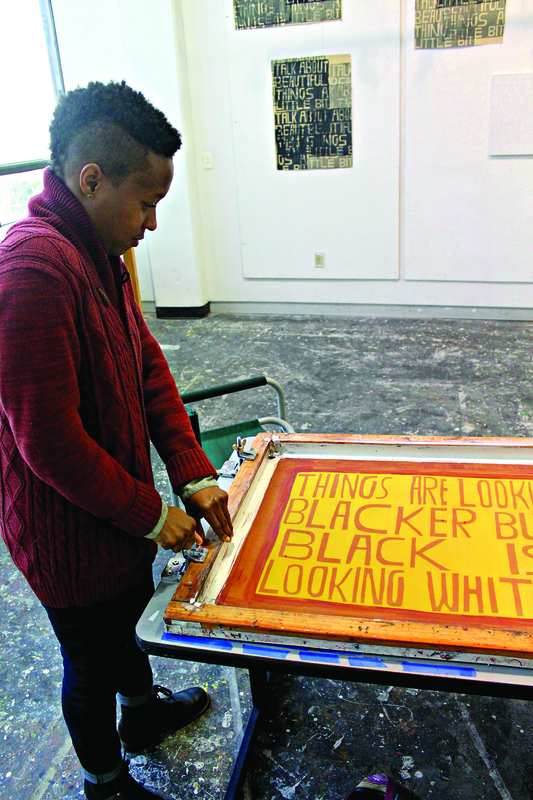 Ayanah Moor prepares for her first exhibit at Georgia State. “The school used its endowment from Ernest G. Welch to bring in scholars and artists from other parts of the country” Stanford said. “I thought she would be a great candidate. The diversity of work is interesting to young people, and I knew she would be a great Welch Scholar”. 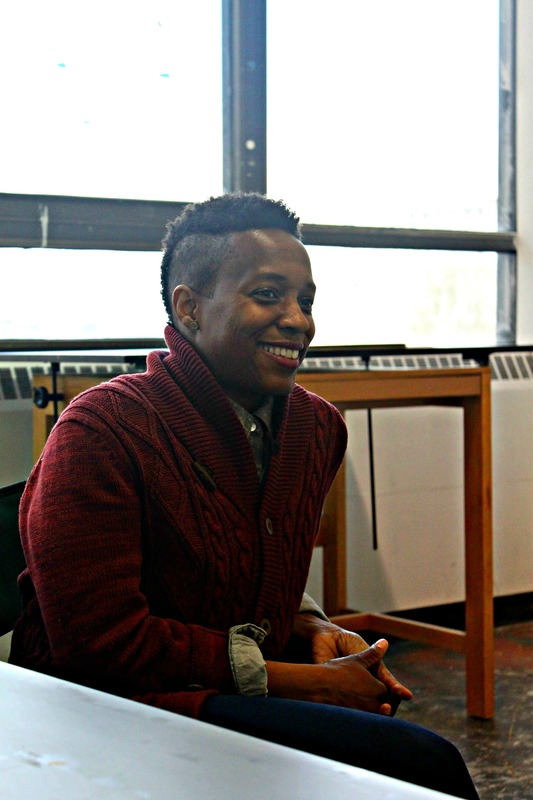 Moor is an Associate Professor who is currently on a yearlong sabbatical, leaving Carnegie Mellon to spread her wealth of artistic knowledge. Stanford met and befriended Moor when she took Moor’s graduate seminar course at Carnegie Mellon University. “She is smart and easy to talk to, and her availability to students makes her the perfect person for the job. She’s very approachable in student’s opinions”. 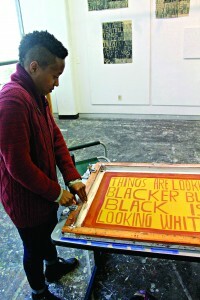 Moor is a visual artist who has multiple facets for her artistic talents, her most prominent focus being Printmaking, a concentration in which she has earned her bachelor’s and master’s degree. She is teaching a seminar class at Georgia State on the aesthetics of hip-hop while preparing for her show at the Welch art gallery. Moor’s Printmaking style involves writing bold quotations and ambiguous messages over blank canvases to evoke deep thought. Stanford confirms that Moor’s abstract style elicits a deeper meaning. Moor’s intriguing and captivating artistic style isn’t easily attained and she says she’s her own biggest critic. Moor also has strong opinions about the topic of art in university systems and believes that students she be careful before deciding to study art. Moor also said she feels that art doesn’t get enough reverence in university systems. Both Stanford and Moor said that they believe Georgia State students could learn a few things from studying Moor’s style while she is here. “Her work ethic and scholarship is something that all Georgia State students can learn from” Stanford said. “Having relocated and being able to create a completely new body of work through all of the adjustments is impressive. There’s a high level of investigation that she puts into her work, and everyone can learn from that”. Moor said that she believes young artists in Georgia State’s community can learn to become more independent and less fearful of expressing themselves. “I would like young artists to trust their own voice more, and not look for their work to be praised by their elders as much. Sometimes it’s disheartening to hear students say they don’t know what to think about something, and always looking for a ‘right’ answer. I want younger artists to recognize their value, and express themselves accordingly“.